If you are looking to buy a new home, a HUD home is one of your options. But what exactly is a HUD home and how is it different from a conventional home sale? We will answer your questions and help you make an informed decision on whether a HUD home is the right choice for you. A HUD home is a real estate owned property, a form of an REO (real estate owned). However, it is much different than your typical REO or what a lot of buyers refer to as a foreclosure property. Foreclosure is a process which means that a home is in default and the bank is actually proceeding with the process with their borrower. If it is not cured or rectified, then ultimately, they will foreclose on the home and take ownership if the home is not sold to an investor at an auction. As an example, if Wells Fargo or Bank of America has the mortgage and forecloses on the property, then Wells Fargo or Bank of America will own the property. A HUD home, on the other hand is an FHA insured mortgage which means that when the seller bought the home, they used an FHA loan for their financing to buy the property. If that same Wells Fargo or Bank of America is to foreclose the property, since the FHA loan is insured by the Federal Housing Administration, then what happens is the bank can cash in on the mortgage insurance and convey the property to HUD. Now, the property becomes a HUD home and it’s the HUD’s responsibility to sell that home. 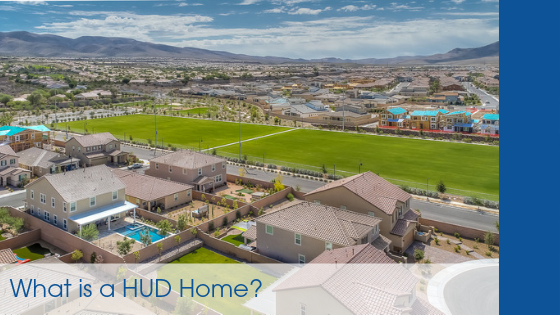 A HUD home can actually be a single-family home, condo, townhome, and it could even be a duplex or a four plex. Because, for example, if you buy a four plex you can buy one with an FHA loan as long as you live in one of the four units. You can buy that as an owner occupant with an FHA loan which means if it’s ever foreclosed on, it would be conveyed to HUD as a HUD property. So, how is it different from a conventional home sale? HUD put a lot of priority on owner occupants. Most HUD homes during the first 15 days that it’s on the market, will only allow primary resident buyers to purchase it. An owner occupant is a primary resident for 12 months after close of escrow and a borrower who has not purchased a HUD home as a primary resident in the last two years. After 15 days, if it has not gone to an owner-occupant, they do open it up at that point to the second homeowners and investors and so forth. One important thing to note is, there are some HUD homes that are not in good condition and might only have a five-day exclusive status on them for owner occupants where they’ll give five days to purchase it, and after that, it will be opened up for investors. Whether it’s 15 or 5 days, there is always an owner occupant exclusive time period for them to get a chance to buy those homes first because HUD does want to put families into these properties. Buying HUD homes is not a hard transaction, they are just different from the conventional home sale. It is very important that you have the right lenders involved that are familiar with the HUD process and the right title companies that are familiar with the closing process because it is quite different with a HUD property and there are certain things that HUD will not pay for that maybe would be more customary for a seller to pay for. For example, HUD will not pay for the owner’s title policy of insurance or real property transfer tax. The full escrow fees paid for by the buyer and these are things that typically are not structured that way with a typical transaction in our market here in southern Nevada. The other things the way that inspections are done, and the utilities are not on with these properties, so the buyer does need to activate those in the buyer’s name. There is also a specific extension policy that is unique to HUD properties if a transaction is not going to close on time. None of these things are difficult, they’re just different and you need to make sure that you know them going into the transaction. So eyes wide open, you know what to expect and if the expectations are set properly, then it should be a smooth experience for the buyer. If they’re not however, then of course some of these things could be quite disappointing to find these things out the last minute, so it is very important to work with an agent that understands HUD properties and can walk you through that process. If you have additional questions, give us a call at (702) 608-6227. If you are curious what your home is worth, click here to find out! If you would like to look at all current properties, click here.